When Sarah Wannarka took a year off from her job as a prosecutor for the Western District of Texas in San Antonio, it wasn’t for a sabbatical. 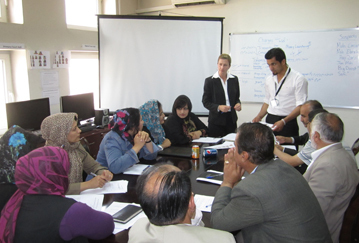 The Junior League of San Antonio member took a 12-month assignment with the Department of Justice’s Rule of Law Program in Kabul as a Senior Legal Advisor mentoring Afghan prosecutors and judges. Sarah learned about the program from two colleagues who had previously served in that role. Intrigued by the unique opportunity to mentor Afghan prosecutors, especially women, she applied for and got the assignment. She says it was the sheer adventure of living in a war zone and the prospect of world travel that excited her. Sarah says that she is impressed every day by the women in Afghanistan—judges, prosecutors and investigators—who are fighting against cultural norms that do not support women as professionals and equals, particularly in the criminal justice system. It’s not that her job in San Antonio is humdrum. There, she prosecutes child exploitation, firearms and white collar crime cases. Sarah’s experience in Kabul has enabled her to put her Junior League training into practice, encouraging young women to reach their potential as leaders just as she did in her JLSA roles as Membership Development Chair and New Member Chair.